This article is about the municipality in Trøndelag, Norway. For other uses, see Steinkjer (disambiguation). Steinkjer is a municipality in Trøndelag county, Norway. It is part of the Innherad region. The administrative centre of the municipality is the town of Steinkjer which is located on the inner part of the Trondheimsfjord. The town is also the administrative centre for Trøndelag county. Other populated areas in Steinkjer include the villages of Ogndal, Hyllbrua, Gaulstad, Beitstad, Bartnes, Vellamelen, Stod, Binde, Sunnan, Byafossen, Følling, Kvam, Lerkehaug, Mære, Sparbu, Vassaunet, and Vekre. The 1,565-square-kilometre (604 sq mi) municipality is the 45th largest by area out of the 422 municipalities in Norway. Steinkjer is the 52nd most populous municipality in Norway with a population of 22,096. The municipality's population density is 15.5 inhabitants per square kilometre (40/sq mi) and its population has increased by 6.9% over the last decade.. The village of Steinkjer in the municipality of Stod was declared a kjøpstad (town) in 1857, and then on 23 January 1858 it was separated from Stod to form a municipality of its own. The initial population of Steinkjer was 1,150. Over time as the town grew, land was annexed from the neighboring municipalities. It started on 1 January 1902 when an unpopulated area from the neighboring Ogndal municipality was taken for future growth of Steinkjer. Then in 1941, an area (population: 57) was taken from Ogndal to add to Steinkjer. Again in 1948, an area (population: 78) was transferred from Ogndal and another area (population: 70) was transferred from Egge municipality. During the 1960s, there were many municipal mergers across Norway due to the work of the Schei Committee. On 1 January 1964, a large merger took place: the neighboring municipalities of Beitstad (population: 2,563), Egge (population: 3,476), Kvam (population: 1,245), Ogndal (population: 2,678), Sparbu (population: 4,027), and Stod (population: 1,268) were all merged with the town of Steinkjer (population: 4,325) to form the new municipality of Steinkjer. On 1 January 2018, the municipality switched from the old Nord-Trøndelag county to the new Trøndelag county. The municipality of Steinkjer and the neighboring municipality of Verran have voted to merge on 1 January 2020 to form a new, larger municipality of Steinkjer. The municipality (and town) is named after the old Steinkjer farm (Old Norse: Steinker), since the town is built on the site of the old farm. The first element is steinn (m) which means "stone" or "rock". The last element is ker (n) which means a "barrier made for catching fish". The coat of arms was granted on 8 March 1957. The arms show a silver star with six points on a blue background. The original meaning of the star was that six main roads crossed in Steinkjer. After the municipal reorganization of 1964, the arms were re-granted, but the meaning has slightly changed. Steinkjer now formed the centre of the municipality and the points are directed to the six other districts in the municipality: Beitstad, Egge, Kvam, Ogndal, Sparbu, and Stod. The Church of Norway has nine parishes (sokn) within the municipality of Steinkjer. It is part of the Nord-Innherad prosti (deanery) in the Diocese of Nidaros. 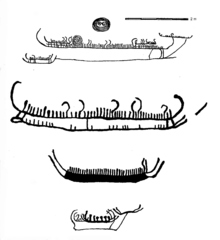 Bronze age rock carvings, Bardal in Steinkjer; see also Nordic Bronze Age. The Steinkjer area has been populated since the Stone Age, as shown by the Bølareinen rock carving, which depicts an almost life-sized reindeer and a bear. There are other rock carvings in the area as well, as in Bardal, the oldest up to 6,000 years old. The Steinkjer area was one of the strongest powerbases in early Viking age. Mære was one of the best known Norse religious places with sacrifices and seasonal gatherings (Norwegian: Hov) before Christianity came to Norway. Steinkjer has survived two major disasters in modern history. The first was a town-wide fire in the year 1900, which burned down much of the southern parts of the town. The second disaster happened on 21 and 22 April 1940, when the town was struck by Luftwaffe bombers during the Norwegian Campaign. Most of the town was destroyed, but no lives were lost. The attack destroyed a large part of Steinkjer, and many priceless historical buildings, such as the old, cruciform Steinkjer Church were lost. The town was, however, quickly rebuilt after 1945 with much aid from the United States. Much of the architecture of modern Steinkjer originates from the 1950s and 1960s with architecture inspired by functionalism rather than the aestheticism of the earlier Art Nouveau style to be seen in such cities as Trondheim and Ålesund. A few historical buildings – for example, the railway station and the town's college – survived the bombing. These are buildings based on the neoclassical architectural style known as Jugendstil. Good examples are the aforementioned railway station (jernbanestasjonen) and the administration building of Nord-Trøndelag University College (Norwegian: Høgskolen i Nord-Trøndelag). All municipalities in Norway, including Steinkjer, are responsible for primary education (through 10th grade), outpatient health services, senior citizen services, unemployment and other social services, zoning, economic development, and municipal roads. The municipality is governed by a municipal council of elected representatives, which in turn elect a mayor. The municipality falls under the Inntrøndelag District Court and the Frostating Court of Appeal. Steinkjer is located at the head of Beitstadfjorden, the northern branch of the Trondheimsfjord system. To the west, the municipality borders the more mountainous Verran municipality (scheduled to merge with Steinkjer in 2020). To the east is Sweden, 60 kilometres (37 mi) from Steinkjer. To the north are the Snåsa and Namdalseid municipalities, and to the south are the Inderøy and Verdal municipalities. Situated 60 kilometres (37 mi) inland from the coast, Steinkjer is actually still connected to the Atlantic ocean through the narrow strait of Skarnsundet, some 25 kilometres (16 mi) south of Steinkjer. The longest cable-stayed bridge in Norway, Skarnsund Bridge, crosses the Skarnsund (total length of 1,010 metres or 3,310 feet). Large ships pass through Skarnsundet and this allows tourists to visit this town by ship. Each year ferries from Hurtigruten make trips to the cruise port of Steinkjer, more than 130 kilometres (81 mi) of travel through the fjord system. The landscape is dotted with wavy hills and dense spruce forests, as well as agricultural fields in the lowland areas. There are many lakes in this region including: Gilten, Fossemvatnet, Leksdalsvatnet, Mokkavatnet, Snåsavatnet, and the group of lakes called Bangsjøene. The municipality covers large areas outside the town itself, much of it farmland or productive forest. View towards the Beitstadfjorden. Steinkjer is one of Norway's larger urban municipalities measured by total area. Approximately half the population lives near the town center, while the rest live in rural areas. However, much of the town is today in the process of urbanization, with the building of several apartment blocks in or within the immediate vicinity of the town. Currently, about 500 apartments are being finished. Steinkjer is one of the northernmost areas with rich agriculture, allowing large production of grain. It is obvious from the landscape that Steinkjer is a typical agricultural municipality. In addition, there are large forest resources in the immediate area. The tallest buildings in Steinkjer are two 40-metre (130 ft) tall grain silos, visible several kilometres south of Steinkjer and today mark the skyline, especially when viewed from the south. Kirknesvaag Sag & Høvleri is a large wood mill and industry park producing wood planks and treehouse module components. Almost half of the inner town area consists of the large industrial park for wood products. Most of the ship traffic is related to transportation of the vast forest resources present in Nord-Trøndelag such as timber and cellulose. An important tree species is Norway Spruce. Further north from Steinkjer, geographical distances between cities grow. The climate of Steinkjer marks a border with the more harsh conditions typical of inland areas further north. The January average in Steinkjer is −5 °C (23 °F), and the July 24-hr average is 14 °C (57 °F). Steinkjer has a sheltered location and is the most northern town with a summer season long enough to allow reliable cultivation of wheat. Steinkjer is therefore recognized as a "border town" between the more densely populated southern parts of Norway and the less populated northern part. Steinkjer has observed temperatures above 32 °C (90 °F), but also winter temperatures below −25 °C (−13 °F). Temperatures have tended to be warmer in recent years. Steinkjer, with its varied habitats, provides the local birdlife with some of the best localities within the region. One of these is Lake Lømsen with its breeding population of Slavonian grebe. The surrounding woodlands and farmlands hold a host of the commoner Scandinavian species, some, like fieldfare and redwing, can be found in good numbers. The municipality of Steinkjer includes lowland forests, alpine forests, as well as areas above the treeline. A part of Blåfjella-Skjækerfjella National Park is located in the municipality. Byahalla, the most northerly deciduous temperate forest (hemiboreal) location in the world, with species such as wych elm, hazel, hepatica, hedge woundwort, and garlic mustard, is located in Steinkjer, probably due to the sheltered south facing location and the good soil resulting from marine deposits. Some moist locations with spruce forests are classified as boreal rainforests and are part of the Scandinavian coastal conifer forests. The shallow river estuaries in the inner part of the Trondheimsfjord have some of the richest bird life in Norway; thousands of migratory birds feed here. Part of Snåsavatnet, the 6th largest lake in Norway, is located in the municipality, and the river from the lake meets the fjord in the town of Steinkjer. Steinkjer lies about 120 kilometres (75 mi) by road north of the city of Trondheim along the European route E6 highway. The Sneppen Bridge is part of the E6 in the town of Steinkjer, crossing the river Byaelva. Norwegian County Road 17 begins in Steinkjer and heads north. This highway is often referred to as the Coastal highway, whereas the E6 runs to the north, but further inland. Steinkjer is the home of the oldest network arch bridge in the world opened to traffic 1964. The bridge is 94 m long and takes the Nedre Mølleveg over the Steinkjerelva. The municipality is situated along the Nordland Line from Trondheim, and is served by Steinkjer Station and Sparbu Station. Steinkjer also has a rich culture and hosts one of the most prominent music cultures in central Norway. Steinkjer is also labeled "Steinkjer Punkrock town" by some of its citizens. The music festival Steinkjerfestivalen was established in 2006. Steinkjermartnan, held each year in August, is a happening where trading booths are staged in the town centre's streets and a traditional trade festival with concerts are held. Steinkjer has the standard cultural facilities like a cinema, town library, culture house (in which many cultural events and concerts are held), and a modern swimming pool called Dampsaga Bad. The swimming pool has a 25-metre (82 ft) long training pool plus heating pools, sauna, two learning pools for kids, and a large swim tube. Steinkjer houses the administration and Faculty of Society, Commerce, and Nature of Nord-Trøndelag University College. Important studies include the School of Forestry (Norwegian: Skogskolen). Historically, Steinkjer has produced a higher than average amount of university students. Only 25% of the students return to Steinkjer. Steinkjer is therefore a municipality that produces many people with higher education students. In Norwegian, municipalities such as Steinkjer that produce many people with higher education who leave the municipality are known as oppvekstkommuner (lit. 'upbringing municipalities'). ^ "Navn på steder og personer: Innbyggjarnamn" (in Norwegian). Språkrådet. Retrieved 2015-12-01. ^ Statistisk sentralbyrå (2018). "Table: 06913: Population 1 January and population changes during the calendar year (M)" (in Norwegian). Retrieved 2019-03-05. ^ Statistisk sentralbyrå. "09280: Area of land and fresh water (km²) (M)" (in Norwegian). Retrieved 2019-03-05. ^ "Bakgrunn" (in Norwegian). Nye Steinkjer. Retrieved 2017-10-01. ^ Rygh, Oluf (1903). Norske gaardnavne: Nordre Trondhjems amt (dokpro.uio.no) (in Norwegian) (15 ed.). Kristiania, Norge: W. C. Fabritius & sønners bogtrikkeri. p. 225. ^ Norske Kommunevåpen (1990). "Nye kommunevåbener i Norden". Retrieved 13 November 2008. ^ Ringdal, Nils Johan (1995). "Steinkjer". In Dahl; Hjeltnes; Nøkleby; Ringdal; Sørensen (eds.). Norsk krigsleksikon 1940-45 (in Norwegian). Oslo: Cappelen. p. 397. ISBN 82-02-14138-9. ^ Hansen, Tore, ed. (2016-05-12). "kommunestyre". Store norske leksikon (in Norwegian). Kunnskapsforlaget. Retrieved 2019-01-01. ^ "Table: 04813: Members of the local councils, by party/electoral list at the Municipal Council election (M)" (in Norwegian). Statistics Norway. ^ "Normaler for Steinkjer". Met.no. ^ "Steinkjer average conditions - base period 10 last years". Storm Weather Center. Retrieved 3 December 2009. ^ "Inner Trondheimsfjord wetland system". ^ Tveit, Per (2006). "An Introduction to the Network Arch" (PDF). Wikimedia Commons has media related to Steinkjer. This page was last edited on 6 March 2019, at 03:00 (UTC).